Quick and easy Mexican pasta topped with simple guacamole! After visiting Mexico their cuisine has become one of my all time favorites! If you ask me, avocado, tomatoes, lime and chili add something to almost any dish. Just like you, I obviously also love my pasta. So why not combine the two? 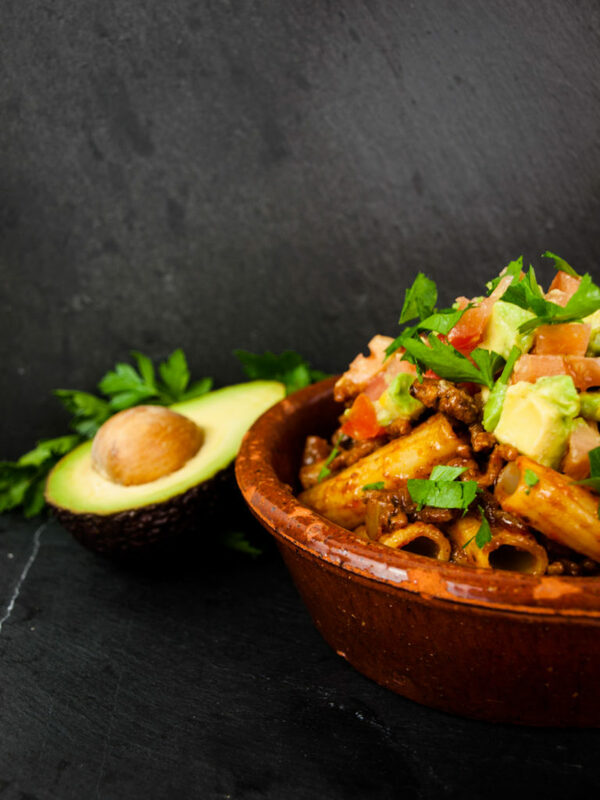 Al dente pasta with browned beef, a tomato sauce, topped with some tasty guac! The guacamole topping is just a simple combination of diced avocado, tomato and some lime juice. You could add some jalapeno if you like to spice up your meal even more. In terms of pasta all shapes will do. However, I guess when it comes to eating spaghetti would turn out really messy, so I’d suggest to use something that holds the sauce and also likes to stay on your fork or spoon. Elbow macaroni, fusilli, farfalle or any pasta in shell form will work perfectly for this dish! If you hurry a bit you can have this dish on the table in less than 30 minutes! It’s quick, inexpensive and super easy to make. So what are you waiting for? Treat yourself and your guest to a Mexican-Italian feast! Boil some pasta, make some sauce and guac it up! Bring a big pot of water to the boil, add salt and cook your pasta according to the cooking instructions. Put a skillet with high rim on high heat. Add the olive oil and fry your beef mince together with the onion and garlic. Break up the meat to make it brown nice and evenly. This should take about 6 minutes. Add the cumin and generously season with salt and pepper. Increase the heat and add in the tomato passata and chili sauce. Stir to combine and bring to a boil. Let the sauce boil for 5 minutes. It will thicken and get a bit sticky. Try it and adjust the seasoning with sugar, salt and pepper if needed. In the meantime, dice your tomatoes. Halve your avocado, remove the pit and cut the flesh into cubes. Combine tomato, avocado and lime juice to prevent the avocado from browning. Season with some salt and pepper. This is your guacamole. Once the pasta is cooked, drain it in a colander. Add the drained pasta to the skillet with the meat sauce. Give a good stir until the pasta is well coated. Divide pasta among plates and put two big spoonfuls of guacamole on top. Garnish your Mexican pasta with some cilantro and dish up immediately! Let me know what you think about the recipe in the comments below! Did you ever had Mexican pasta before? What kind of chili sauce would you use for this? Think this dish should be even more Mexican with black beans in it? Actually, that’s a pretty good idea… Wait, let me get back into the kitchen! In the meantime all your feedback is welcome – let’s make this dish even better together!